The VT-7 has an all Class-A vacuum tube audio path, like all our products. The gain reduction elements utilize circuitry that duplicates the sound and characteristics of the finest classic vacuum tube compressors, without depending on tubes that are no longer manufactured. The control circuitry is modern solid-state analog. The two channels may be used independently or linked together for stereo. Controls: Threshold, Gain, Attack, Release, Curve, and Link. 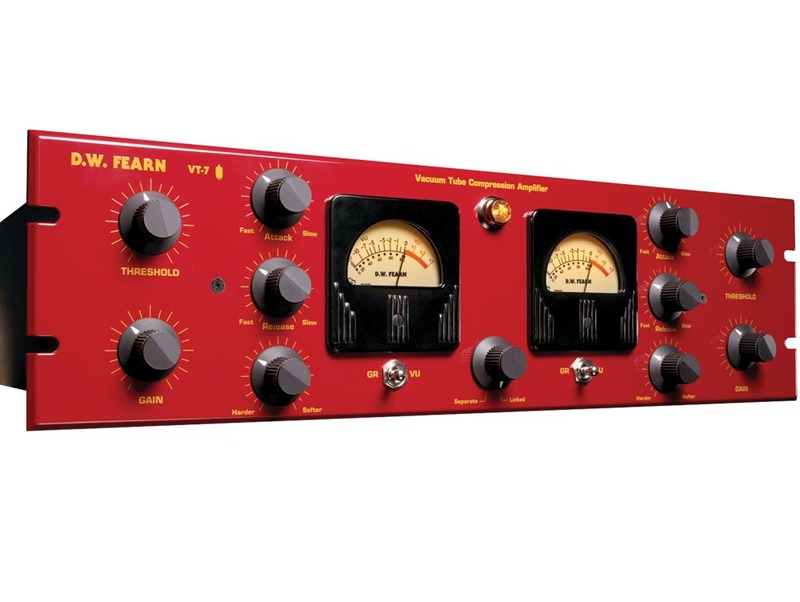 The VU meters can be switched between output level and gain reduction.This compressor has a unique sound. It is highly transparent, adding only loudness to the audio without introducing obvious artifacts. The compression curves can be adjusted from very gentle to moderately hard. Like all our products, the VT-7 Compressor is designed to process high-quality audio and make it sound great. This compressor is not intended to be used as an obvious effect. It is more like having an engineer with infinitely quick hands on the faders. Ich konnte den D.W.Fearn VT-7 bei der Abmischung von 9 Titeln der neuen Xavier Naidoo CD "Telegramm für X" ausgiebig testen und kann mir den Fearn nicht mehr aus meinem Studio wegdenken.. . Obwohl mein Studio sehr gut mit Kompressoren ähnlicher Bauart (Fairman, Chandler, Neve, Amek, Teletronics....) bestückt ist. Ich liebe ihn auf Vocals, Bass und Drums ! Weiterführende Links zu "D.W.Fearn VT7 Vermietung"
Kundenbewertungen für "D.W.Fearn VT7 Vermietung"